Media outlets and liberal commentators have met President Donald Trump's pick of Miriam Adelson, wife of Republican mega donor Sheldon Adelson, to receive the White House Medal of Freedom with indignation, attacking the prominent philanthropic family as a poor choice for such a prominent honor. But many of these same media outlets and political prognosticators remained silent as former President Barack Obama bestowed the same honor on a cadre of his liberal celebrity friends and donors, including Ellen DeGeneres, a television host known for dancing, actor Robert DeNiro, an actor who wants to punch President Trump in the face, and singer Barbra Streisand, among other notables. 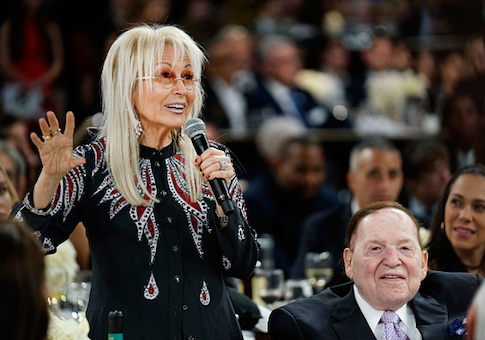 The attacks on Miriam Adelson have waded into anti-Semitic waters as some criticize the wealthy Jewish family for its political donations to Republicans across the country. However, Adelson, a physician and active Jewish philanthropist, has spent decades working for charitable causes that have benefited the lives of many. The attacks on Adelson, according to sources close to the White House and elsewhere, are politically motivated and highlight a concerning double standard in the media between the actions of Obama and those of Trump, these sources say. In fact, nearly all of Miriam Adelson's philanthropic work is non-partisan and focused on aiding the medically ill and pro-Israel organizations across America, according to a Washington Free Beacon analysis of the prominent family's non-profit activity. Adelson, through her medical research non-profit, the Dr. Miriam and Sheldon G. Adelson Medical Research Foundation, has donated more than $110 million in grants given from 2011 to 2015, according to 990 tax forms filed by non-profit organizations with the IRS. These donations come in addition to millions she has helped distribute as part of the family's Jewish educational philanthropic organization, which provides grants and other monetary aid for secular and Judaic studies curriculums running from preschool to 12th grade. The Adelson family foundation also has spent millions over the years to promote pro-Israel causes and organizations that work to support the Jewish state and bolster the U.S.-Israel alliance, work that while non-partisan in nature, has been criticized by those seeking to undermine Adelson and the family's ties to the Trump administration and other conservative causes. Sources close to the White House expressed disgust over the recent attacks on Miriam Adelson, telling the Free Beacon she is just as qualified, if not more, to receive the medal than many of the celebrities Obama fêted with similar ceremonies at the White House during his time in office. "Miriam Adelson is one of the most prominent philanthropists in America when it comes to a range of issues, including and especially medical research," said one Jewish Republican official close to the White House who spoke to the Free Beacon about the matter. "Trump's opponents and Democrats in general like to assume that anything that involves American Jews is about money, but that's not actually how any of this works." Prominent voices from the pro-Israel community and Republican political circles also pushed back against attacks on Trump and Adelson. "The complaints against a medal for Dr. Adelson are ridiculous," said Elliott Abrams, a veteran foreign policy expert who served at the highest levels of the George W. Bush administration and others. "She is a physician who has donated time and money to combating addiction, especially drug addiction." "She did work on addictive diseases at Rockefeller University before she met Sheldon, and has used her fortune to support work in that field," Abrams said, noting that "Obama gave the Medal of Freedom to a list that included Chita Rivera, Robert De Niro, Barbra Streisand, Ellen DeGeneres, Warren Buffett, and Melinda Gates. People who said nothing about all of that and now criticize the medal for Dr. Adelson are simply being nasty and partisan, and are not actually taking a look at her remarkable charity in the chemical addiction field." Josh Block, a prominent Jewish Democratic voice who now runs the Israel Project, a non-profit organization, also heralded Adelson's philanthropic work. "Democratic and Republican administrations have long recognized the important impact that philanthropists play in our society when awarding the Presidential Medal of Freedom, and as a leader demonstrating the value of charitable giving, Miriam Adelson's generosity and philanthropic investments—from life-saving medical research to fighting drug addiction as well as her support for Jewish education—are inspiring and impactful, changing lives for the better, and in the same tradition of previous philanthropists upon whom this honor has been bestowed," Block said. This entry was posted in Politics and tagged Donald Trump, Sheldon Adelson. Bookmark the permalink.